Our products undergo extensive testing to guarantee their compliance with rigorous industry standards and requirements. Overload test - During this test, products are loaded with 3 to 5 times the maximum weight indicated. 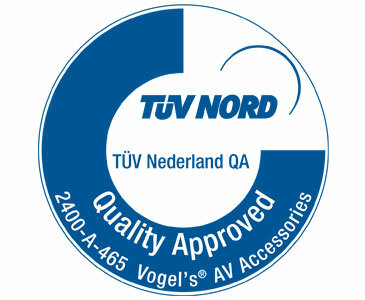 The result of these tests is that Vogel’s products carry the TÜV Nord certification standard. This means that they have passed the tests with flying colours! Vogel’s provides a guarantee on its products. Many of our TV brackets even come with a lifetime guarantee.